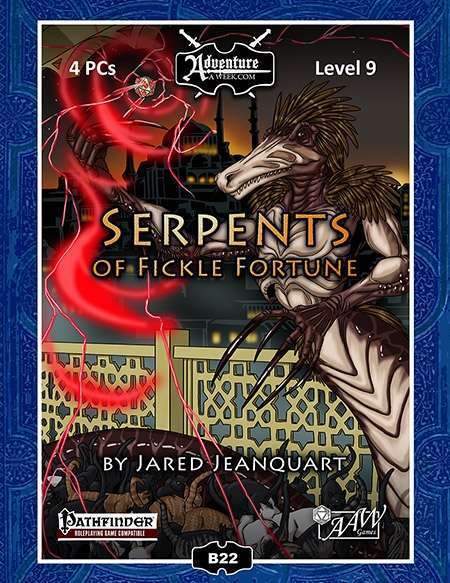 A Pathfinder compatible adventure for four 9th level PCs. It was supposed to be an easy job; find the knucklebone of fickle fortune, kill the thespian gangsters, get paid. Instead the fabric of reality has been torn a new one, and the agents of pure chaos are pouring into Arefast! A protean raid has come to the Material Plane on a scale never before seen. Now the city is beset by swarms of cats, reality-twisting weather, and legions of bickering outsiders interested in only one thing: “lulz.” Faced with such incomprehensible enemies, the party must track down their leader and end the otherworldy assault before Arefast is warped and twisted beyond recovery. The fragments of fickle fortune, lesser dice infused with the power of raw chaos, capable of summoning allies and granting boons, or possibly just conjuring a platypus. A description of Arefast, a city ruled by the iron fist of bureaucracy, trapped between outmoded proprieties and the unsympathetic grind of progress. Encounters and magic items inspired by that eternal cesspit of chaos and entropy, the internet.